This is the ULTIMATE Gray Cook bundle—ALL of his OnTarget book and DVD products in one discounted package, plus ALL of his digital audio lectures! This is a complete set of Gray Cook's recorded audio lectures, collected and reformatted into an audio OR edited transcript ebook. If you would like to order BOTH formats, put both items in your shopping cart. A 10% discount will automatically be applied. Here Gray Cook explains the concept of resetting, reinforcing, then reloading, and tells us why it's a mistake to get these in the wrong order. This talk will also give you an idea of the difference between the FMS and the SFMA, and how the same exercises can be used for different results depending on the situation. Here's where you can spend a half-hour with Gray Cook as he develops his thinking about the mental aspect of discovering and working through movement issues. In this talk, Gray Cook discusses the important points he made in the book Athletic Body in Balance, and follows that with what changes or additions he'd make if he were to re-write the book now, 10 years later. In this lecture, physical therapist Gray Cook explains the thinking behind the concept of self-limiting exercise, tells how the idea came to be, and gives examples you can immediately begin to use yourself or with your clients. This is Gray Cook's talk on the movement principles, given at CK-FMS May 2013. 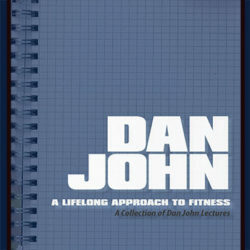 It's an overview of his philosophy of movement, and the foundation of the Functional Movement Screen. It was a live talk, and unfortunately the sound quality is not the best. This discussion begins with references to the Upper- and Lower-Crossed Syndromes, and weaves its way through coaching, competitive sports and clinical patient treatment. Spend a half-hour listening in as Gray Cook and Craig Liebenson talk about what they learned from the work of Vladimir Janda and others, and how they developed that learning into something more. This is the first in a series of dialogs between Gray Cook, PT, and Craig Liebenson, DC, in which they share their insights about the origins and evolution of functional movement assessment. This Gray Cook lecture was recorded live at the VCU School of Medicine Physical Therapy department, during which he outlined his hope for the future of physical therapy and strength and athletic training programs. When should we seek medical attention; when should we prescribe or practice corrective exercise? Do we have a checklist, or is there one on the horizon? 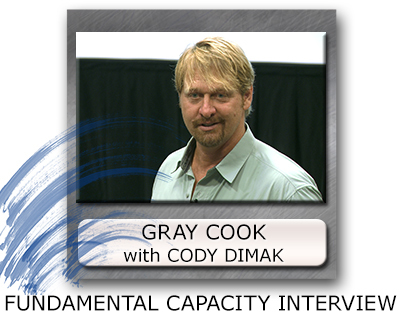 In this talk, Gray Cook clarifies the difference between isolating a body part or a pattern. He then gives examples of how he uses that difference to work toward success. What's the difference between bridging, activating the glute and half-kneeling work? Listen in as he explains. In this interview-style lecture, physical therapists Joe Heiler and Gray Cook discuss the nuances of function, its definition and how the concept could be applied to rehabilitation and performance. A little off his normal lectures, in this short session, Gray Cook talks about professionalism...how we can think and behave in ways the reflect well toward our peers and our clients. In this two-hour session, Gray Cook visits with the first- & second-year physical therapy students at Duke University to give them an impression of possible clinical experiences to come, and to answer their questions. By now you've heard of dry needling, but do you know what it's used for? The creator of the KinetaCore® Physical Therapy Education Company, Edo Zylstra, sits down with Gray Cook to discuss how they use dry needling and how they integrate it into their physical therapy practices. Some of these products are digital; some are physical products to be shipped. 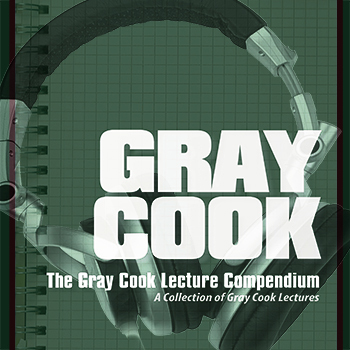 This is the ULTIMATE Gray Cook bundle—ALL of his On Target products in one discounted package, plus his all of his digital audio lectures! It’s a mix of both digital and physical items, and you can order either or both editions. You can choose all or some of the elements above.